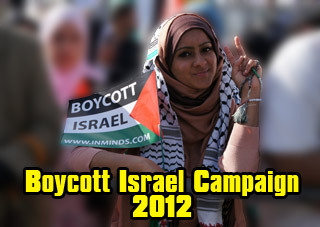 Boycott Israel News: Why Boycott Marks & Spencer 2011? 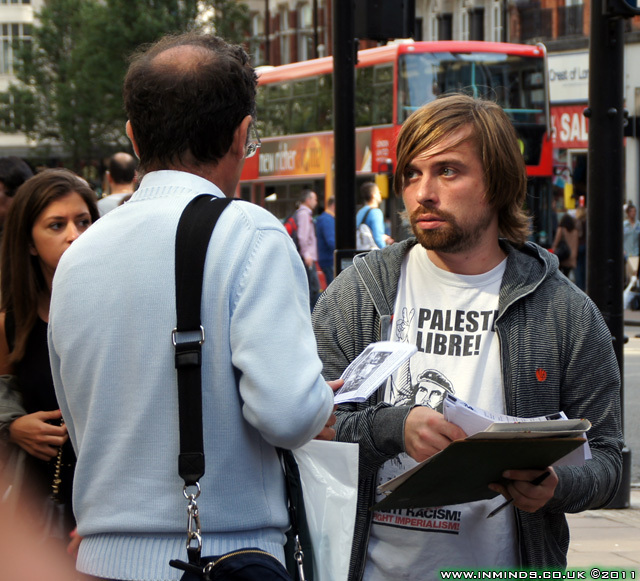 On Saturday 24th September 2011, pro-Palestinian activists demonstrated outside Marks & Spencer's flagship store in Oxford Street, London calling for a boycott of the store for its ideological and economic support of the Zionist state. 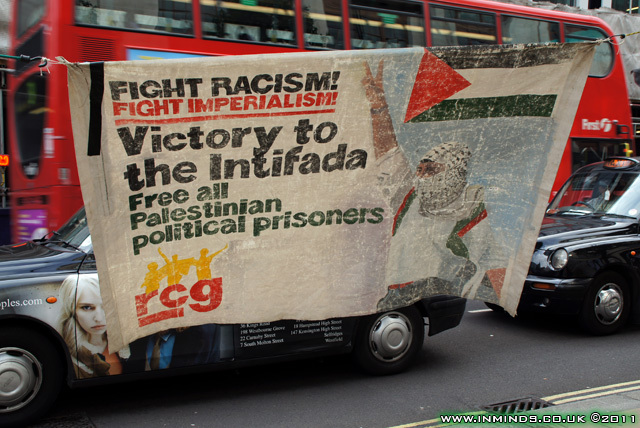 The demonstration was organised by the 'Victory to the Intifada' group which is part of 'Fight Racism! 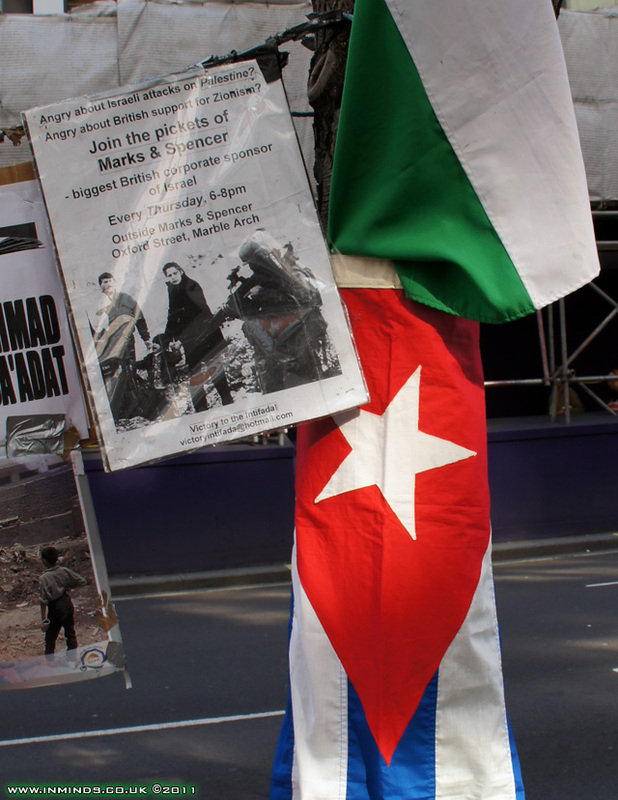 Fight Imperialism! 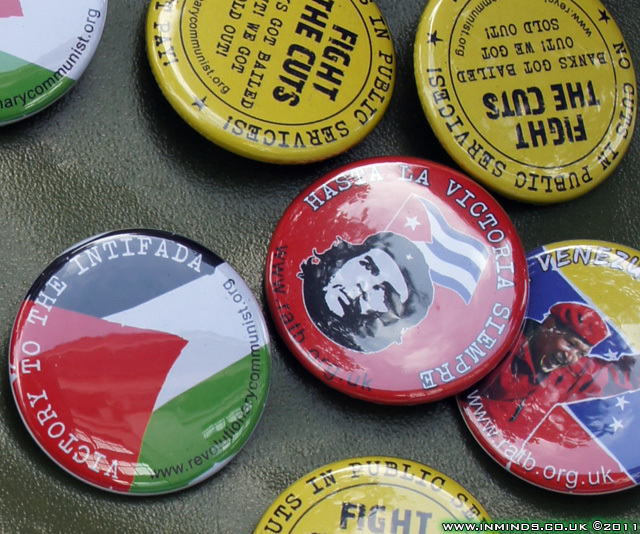 ', a group that has a strong history of action in the South African anti-apartheid struggle, in particular in the Non-Stop Picket of the South African embassy in London in the late 1980s. 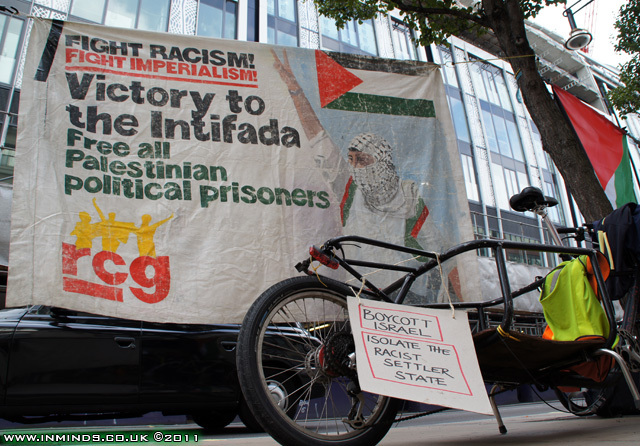 'Victory to the Intifada' group, together with other groups, has been picketing M&S stores around the country, including both flagship stores in London and Manchester, for the last 11 years. 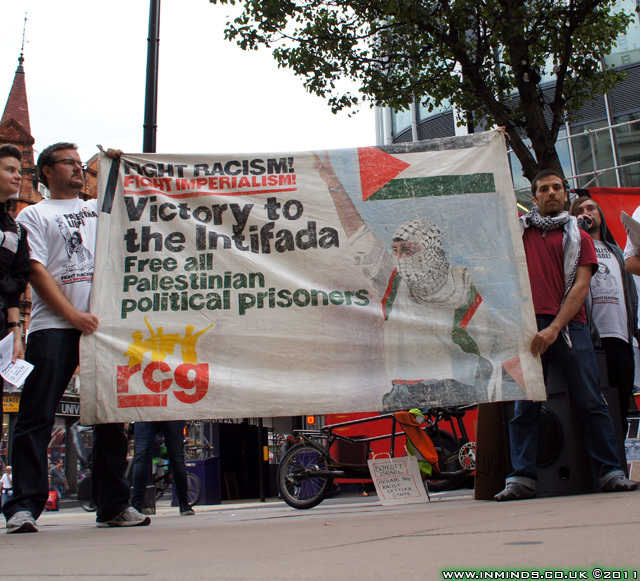 This particular demonstration was to mark the 11th anniversary of the Al Aqsa Intifada when the Palestinians rose up against the Israeli occupation. 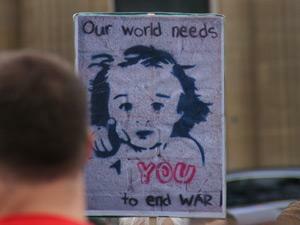 Over 30 activists came together for the action. 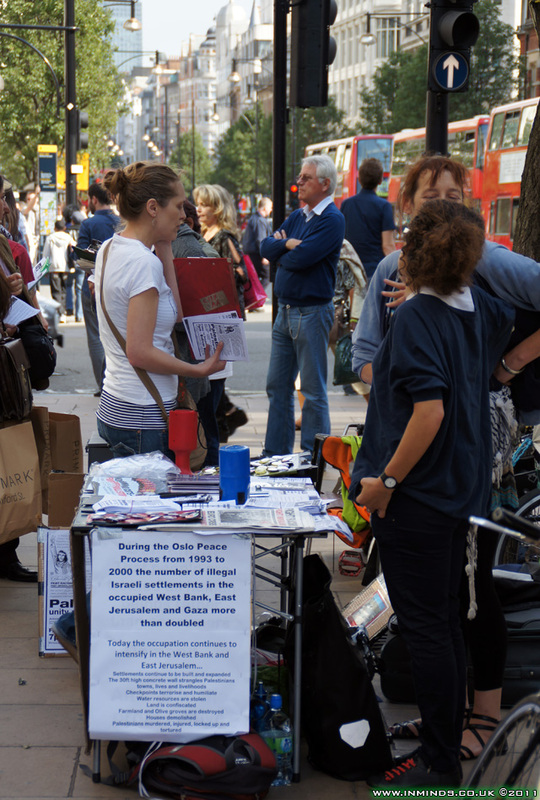 A stall featuring free literature, badges, t-shirts, and books for sale was set up across from the main entrance of M&S. 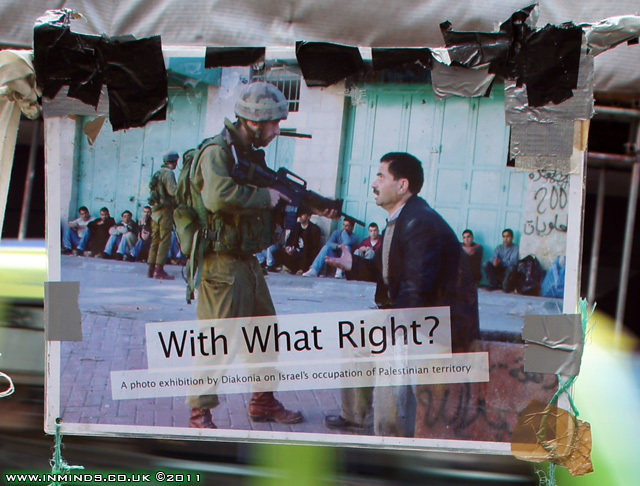 Hanging from a cord between two trees was displayed a photo exhibition of Israel's occupation of Palestine. 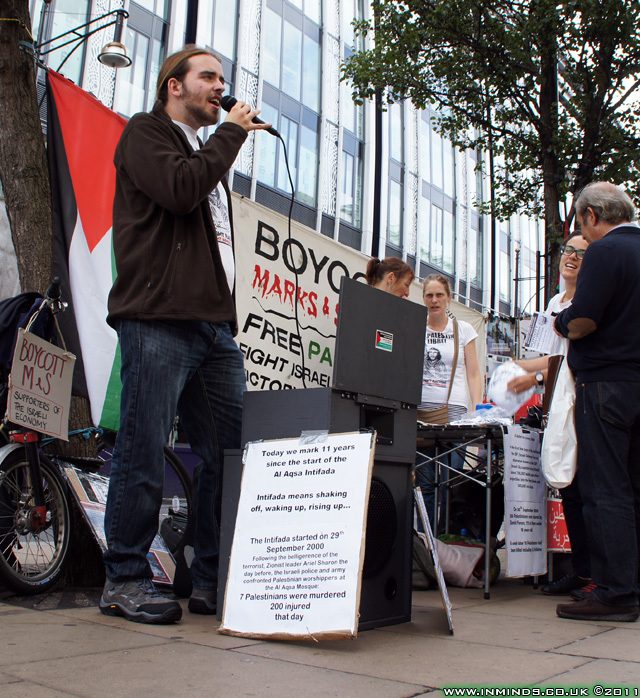 An impressive home made public address system took centre stage, with activists taking turns to address shoppers about M&S's complicity in Israel's occupation of Palestinian land, and successive British governments complicity in Israel's war crimes. Between speeches revolutionary music blasted through the speakers creating a carnival atmosphere attracting people to stop and listen. 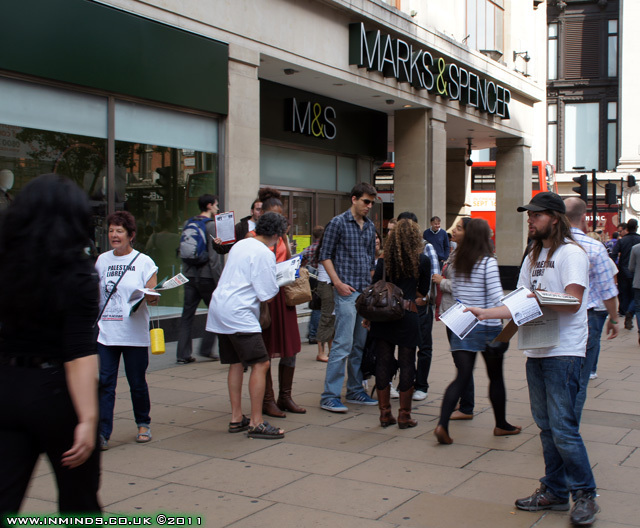 People were urged to boycott M&S and to sign a petition. 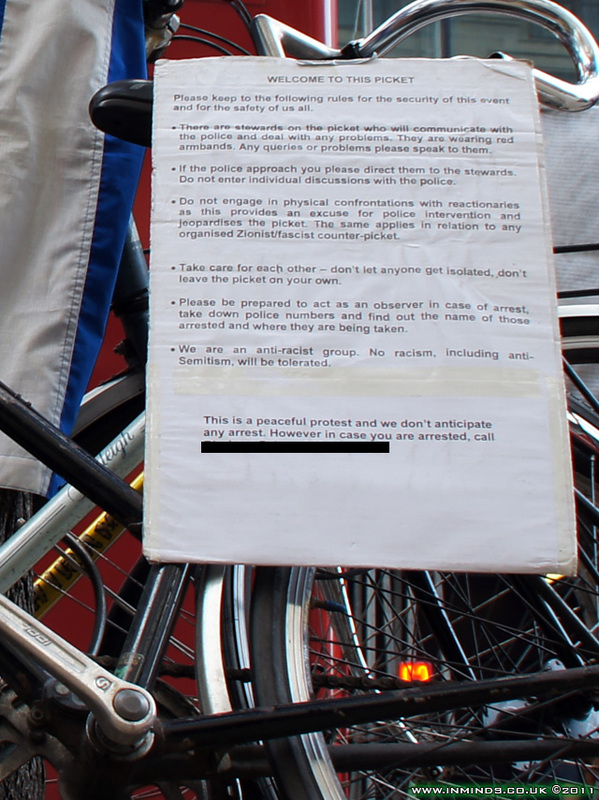 With Oxford Street on a Saturday offering the UKs best footfall, many people signed the petition. 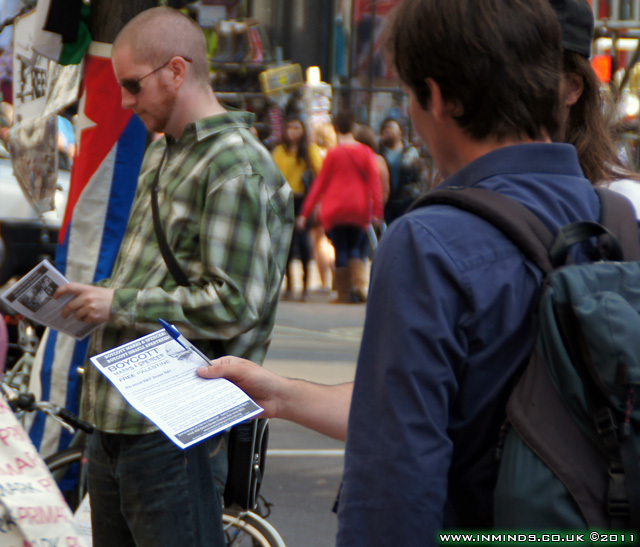 The petition was also a great tool to enable activists to directly engage with the public - talk to them one-to-one about Palestine. The public's reaction to the demonstration was very positive, several terminating their shopping trips to join the picket and many insisting on donating money towards the cost of sustaining a picket for over 10 years. 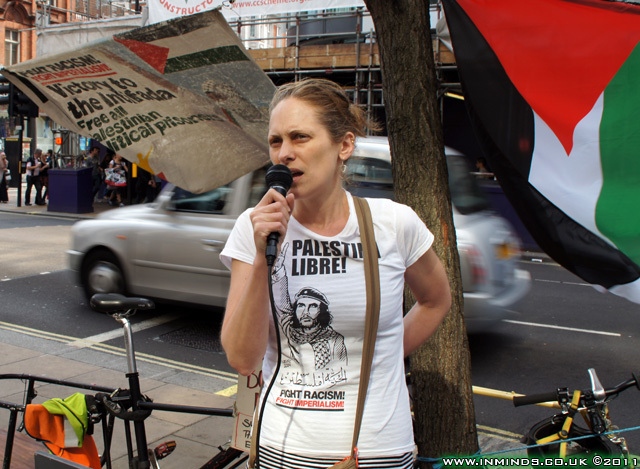 One Zionist did however take offence and threw something at one of the women speakers before scuttling off. 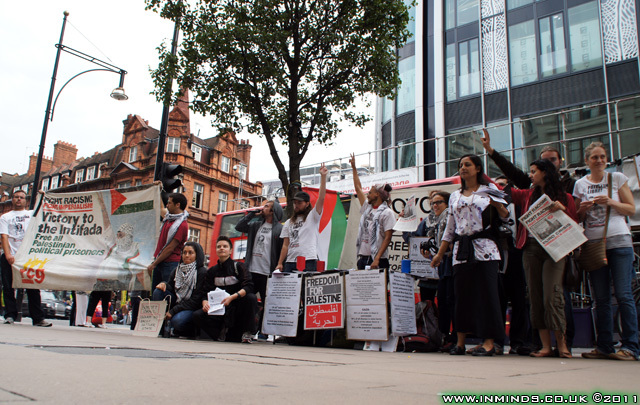 Why not support the Palestinians and join the picket outside Marks and Spencer on Oxford Street, its held every Thursday between 6-8pm without fail. The closest tube station is Bond Street (W1C 1AP). Perhaps one indicator of the success of the picket outside M&S, now in its 11th year is the change in the position of M&S with regards to the settlements. 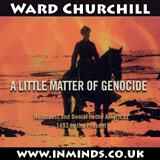 In the early days of the picket when a shareholder raised the issue of M&S's fraudulent labelling of settlement products at Marks and Spencer's 2002 Annual General Meeting, Chairman and Chief Executive of Marks and Spencer Mr. Luc Vandervelde was very hostile, repeatedly referred to the Occupied Territories as being part of Israel stating that "We will continue to label goods as made in Israel whether from the West Bank or Gaza." 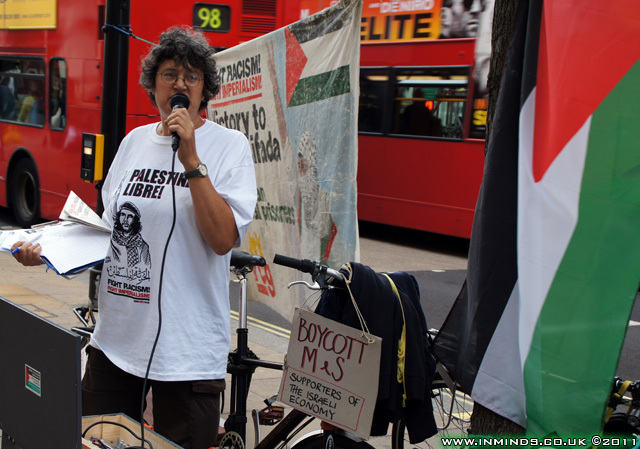 Recently M&S has done a u-turn and announced that since mid-2008 it has stopped sourcing products from the West Bank and Gaza. 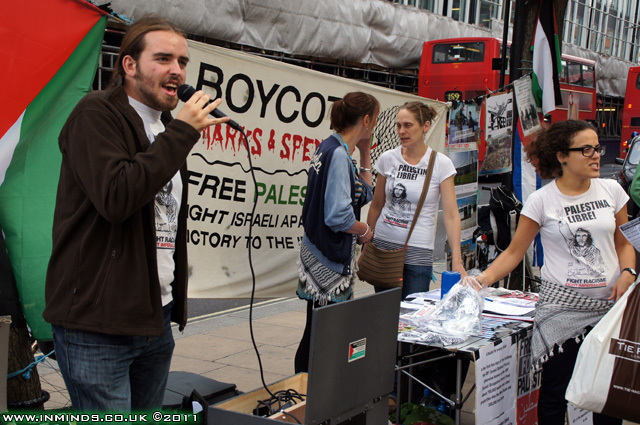 Whilst M&S didn't openly admit that the reason for the change in policy was the success of the boycott and picket outside their stores, it was clear that their stated reason of safety concerns for their staff was nonsense since during the peak of the Intifada there was no safety issue for their staff visiting their suppliers in the West Bank and Gaza. Of course this is just their stated position, in reality M&S still sources from the same settlement exporters Hadiklaim and Agrexco, both of which have a documented history of supplying settlement produce mislabelled as Israeli produce. 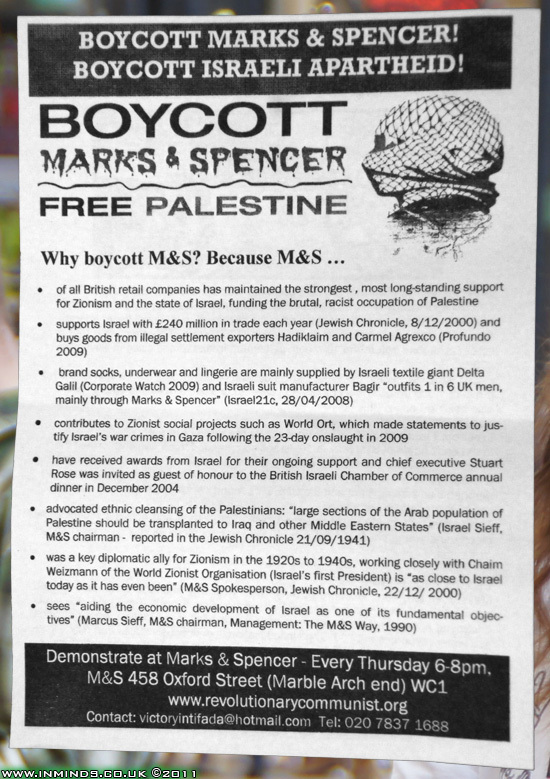 Also in their correspondence M&S refers to the West Bank and Gaza in the Zionist vocabulary of "disputed territories" rather than "occupied territories" as recognised in international law; and alarmingly M&S appears not to include East Jerusalem as part of this "disputed territory". 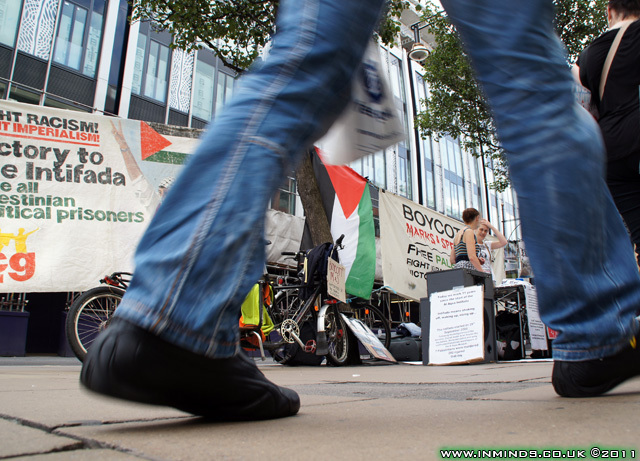 An interesting corollary is that the announcement of the action led to discussions amongst activists from different groups, a few questioning the suitability of M&S as a target for the BDS movement. The concerns raised and our responses are provided below. 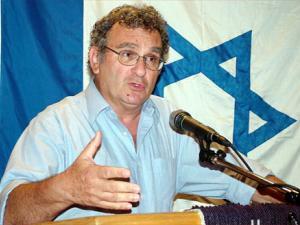 "Simon Marks and Israel Sieff [M&S chairman and M&S director] played a major role in early Zionism. 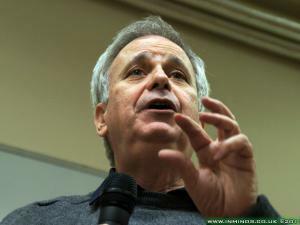 In a virtual coup they ousted the anti-Zionist stalwarts of the British Jews' Board of Deputies. Acolytes of Chaim Weizmann, they set up the Palestine Office in London, which propelled the passage of the 1917 Balfour Declaration (statement of British support for a Jewish state). Israel's wife Rebecca Sieff, co-founded WIZO (the Women’s International Zionist Organisation) in 1920, and helped to run it for 20 years. In 1934 the Marks and Sieff families set up the Daniel Sieff scientific research institute in Rehovot, which in 1948 was incorporated into Israel's renowned Weizmann Institute.."
1. Why pick on M&S? 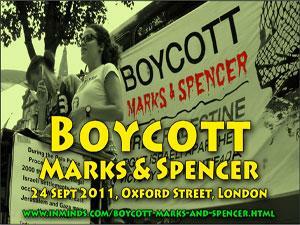 Many in the solidarity movement have never supported the M&S boycott because of M&S's so-called "Jewish connection" feeling the boycott was either inspired by anti-Semitism or otherwise would be seen as anti-Semitic because it was picking on the most visibly "Jewish shop" in the UK. We felt just the opposite, to give M&S a 'free pass' just because of its "Jewish origins" would pander to anti-Semitism. 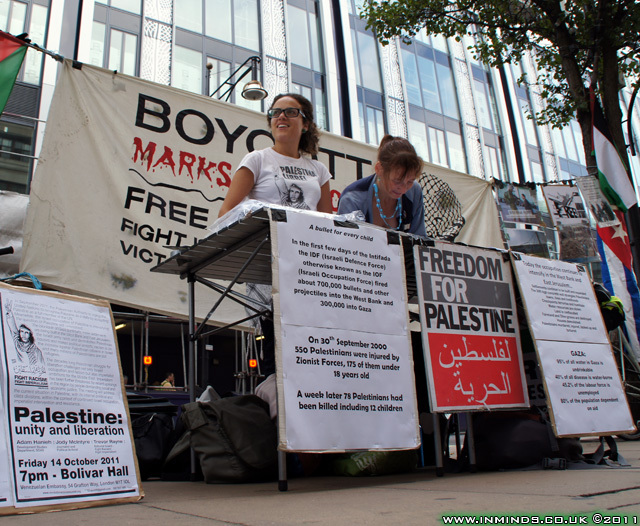 The reality is that no other business in the UK is so seeped in supporting Zionism as M&S, from its origins in helping lay the foundations for the Balfour declaration, to its long time chairman stating that one of the fundamental objectives of M&S is to aid the economic development of Israel, to its London offices been laid open for official Israeli government meetings - all this at a time when the company was meant to be a PLC, accountable to its shareholders. 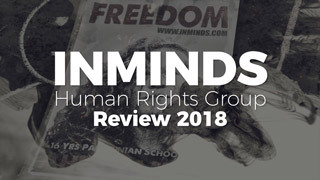 Employees have admitted that M&S policy was to "fly the flag for Israel and try and encourage its industry", staff were "encouraged" to spend "extra curricular" time supporting "Zionist causes" and "it actually helped your promotion prospects". It can be argued that without M&S Israel would not have a textile industry today, certainly the Israeli textile giant Delta Galil would not have survived without M&S's patronage. 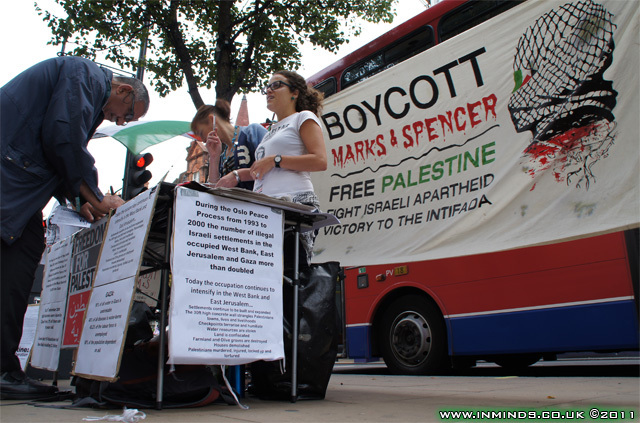 To this day M&S still has a 'buy Israeli' policy although now Israeli companies have moved their sweatshops to Egypt, Jordan, and South East Asia so the M&S label will no longer read 'made in Israel'. 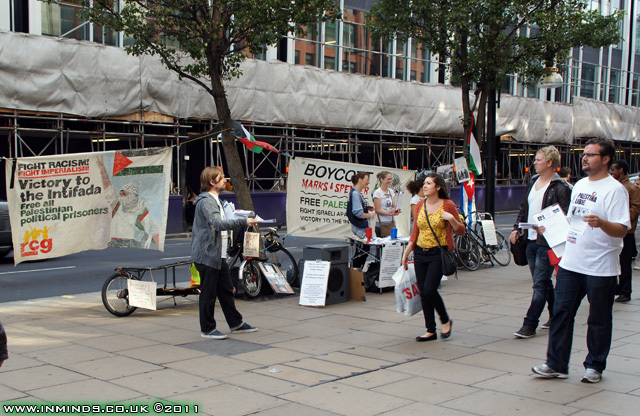 With public support for Palestine growing, with a permanent picket camped outside its doors, M&S is now more sheepish in advertising its support for Israel and it closely guards its trade figures also reclassifying much of it as trade with the countries where the Israeli sweatshops are located rather than with where the money goes. We have seen little evidence of any real change, its claim of dropping settlement goods is a hard earned victory which we need to build on.. the boycott continues and expands. With M&S's recent entry in to Egypt a boycott campaign has now been launched in Egypt, inshallah, this will help reinvigorate the M&S boycott across the Arab world. 2. 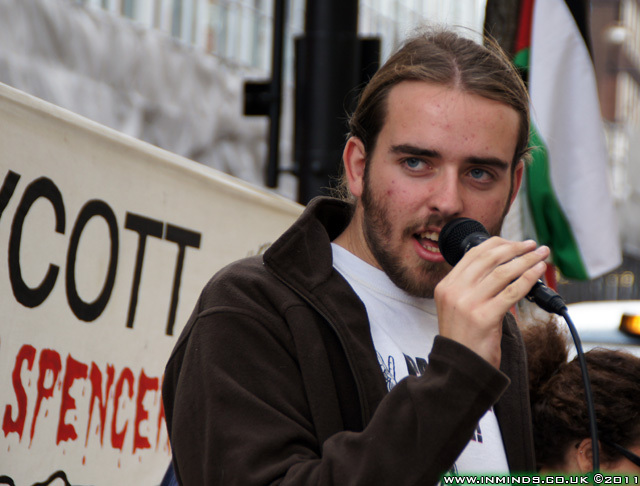 BDS is not about boycotting individual shops (unless they are Israeli!) but boycotting the goods. So while we'd boycott dates from M&S, there is no need to boycott M&S? 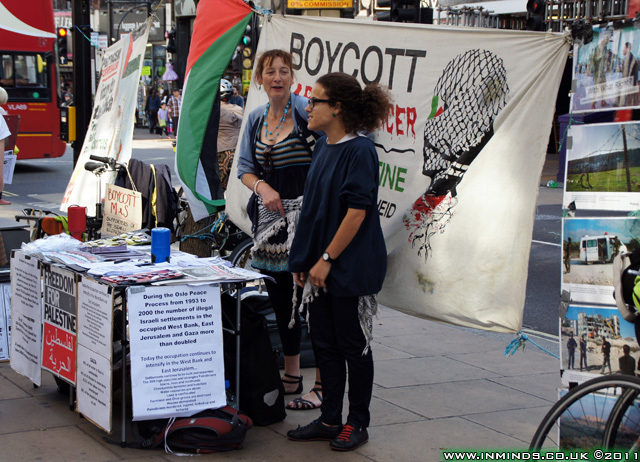 A strength of the BDS campaign (BNC) is that it essentially leaves it up to activists to pick their targets and determine what is possible for them. Clearly M&S's relationship with Israel is more than just a business one, the ideological support they have given Israel whilst trading as a PLC cannot otherwise be explained. 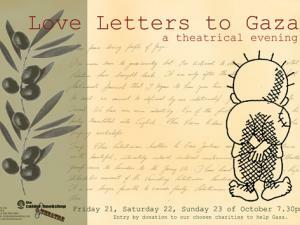 With this they have made themselves a target for the BDS movement. BTW It's not strictly accurate to suggest that BDS isn't about boycotting shops, the Palestinian BDS National Committee has in the past explicitly called for a boycott of a non-Israeli shop, one that doesn't even sell Israeli goods - H&M in response to its opening of its second store in Israel, the investment coming just on the heels of the Israeli onslaught on Gaza. H&M Whitewashing Israel's Colonization of Jerusalem, BDS National Committee calls for Boycotting H&M! 3. 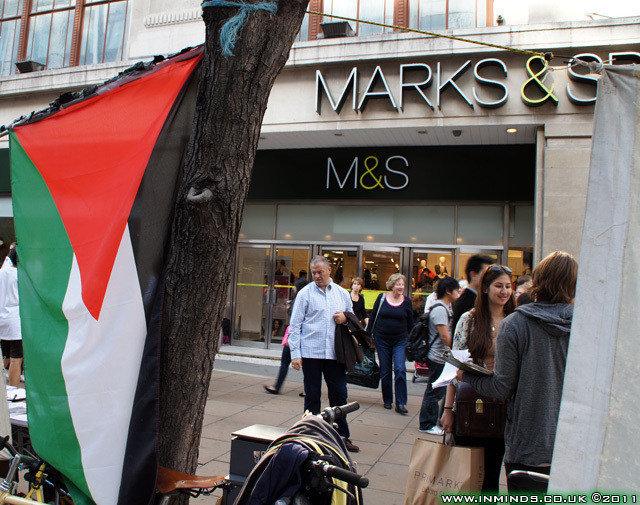 M&S are now one of the better stores as they do at least try not to sell goods from the Occupied Palestinian Territories. Why single them out? 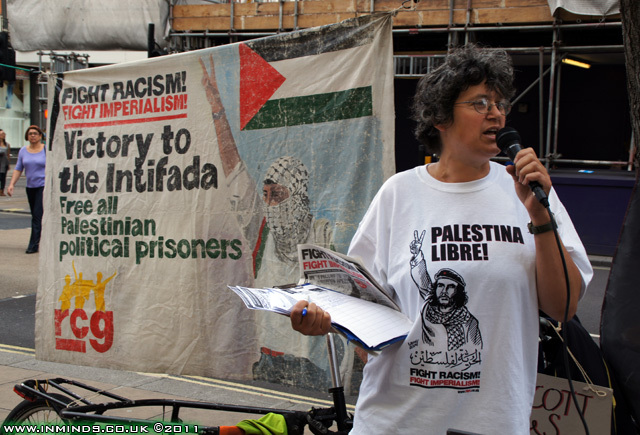 Essentially for us every inch of Israel is occupied Palestine. 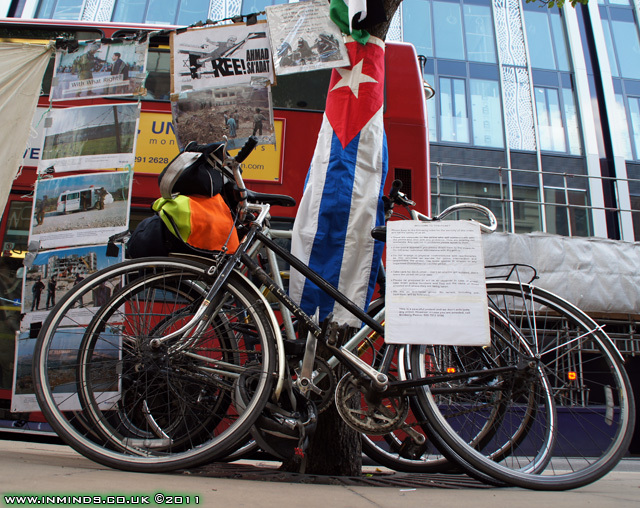 The distinction between Occupied Palestinian Territories (OPT) and Israel is purely strategic for campaigning as those trading in settlement goods are more vulnerable under international law and EU legislation than those trading in Israeli goods (since Oslo), its the weak link so we pick on it. But at the end of the day an orange from the West Bank and an orange from Israel still amounts to a stolen Palestinian orange. Also, the Palestinian call for BDS is clear on this point - it calls for a total boycott of Israeli goods and makes no special distinction of settlement goods. 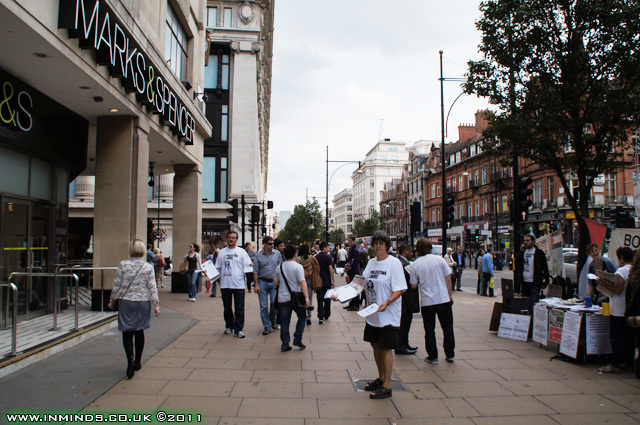 Do you not think that M&S's decision to stop selling OPT goods has something to do with the picket camped outside their flagship stores in London and Manchester for the past 10 years? Our total admiration for those dedicated activists and their resilience to all the attacks they have gone through including asbos, prosecution, physical violence, being hounded at place of work, etc. If anything this is the time to intensify the campaign, not pull the rug from under it. 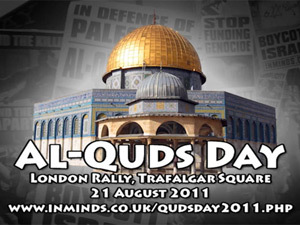 British Muslims are being urged to boycott Israeli dates when breaking their fast during Ramadan in protest at the continued occupation of the Palestinian territories.